It’s March 21st—the first full day of spring—and it’s snowing in our Mid-Atlantic burg of New York City. Time for some hot chocolate! We just tried Hot Chocolate On A Stick from The Ticket Kitchen of San Francisco. A high-quality block of chocolate is molded onto a stick and you stir the stick in a cup of hot milk until it becomes hot chocolate. This is not for the impatient. The chocolate doesn’t melt quickly (and in two tries we couldn’t get it to melt entirely, either). But that’s the fun of it—as well as tasting your hot chocolate at numerous different degrees of chocolatiness as more chocolate melts into the milk. The French couverture chocolate is very good. So if you get tired of stirring or waiting for the chocolate to melt, eat it like a lollipop. If you’re looking for a special party activity or a treat for kids, this is different and fun. 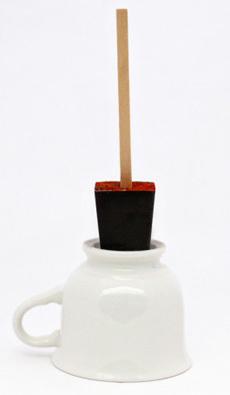 Chocolate On A Stick can also be a special party favor or gift. You can download a customizable label template to mark festive occasions (a baby shower, for example). We only tried the French dark chocolate, but we’re intrigued by the Three-Chili, which blends ancho, cayenne and chipotle chiles into the chocolate for a hot-and-hotter effect. But, with all the couverture chocolate we have around here, we’re first going to try to make our own chocolate-on-a-stick in an ice cube tray—some with mini marshmallows, some with fresh mint leaves (seems like we’ve got a lot of that, too). Hot Chocolate Extravaganza: Reviews of more than 65 hot chocolate brands. Terminology and the difference between hot chocolate and cocoa. Try ‘em all: 25 variations you can make with hot chocolate.